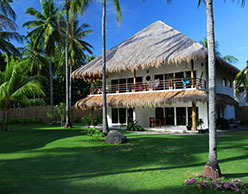 On the southern tip of Negros, tucked away in a former coconut plantation of seven acres, is the truly splendid Atmosphere Resort. The welcoming and luxurious resort enjoys a beachfront location with a heady mix of muck and reef diving right on its doorstep, not to mention the world renowned Apo Reef just a short boat ride away. 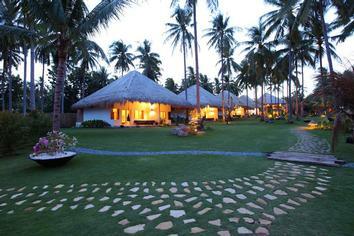 The resort comprises just 26 rooms, with a real emphasis on personal service. 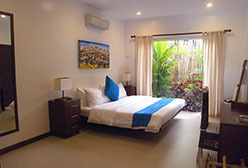 All rooms are air conditioned and with en-suite bathrooms. Contemporary design, light and airy rooms with colourful yet tasteful furnishings combining local materials with modern touches and very comfortable furnishings make for a splendid home away from home. 14 suites are located in the perfectly manicured gardens and each enjoys it’s own private miniature garden with outdoor shower. Each has a King sized bed, desk, television and wireless internet access. 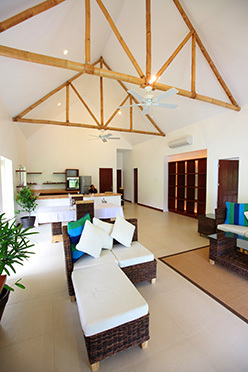 8 Apartments enjoy extra facilities such as a spacious lounge, fully equipped kitchen and private veranda complete with seated hammock. The master bedroom has floor to ceiling views over the garden. 4 Penthouses are Atmosphere’s most luxurious accommodations. Families can take advantage of the extra bedroom and lots of space. Penthouses have fully equipped kitchens, lounge and dining areas and large verandas where one can dine al fresco. Dining at Atmosphere is an experience in itself at ‘Blue’, the resort’s restaurant. 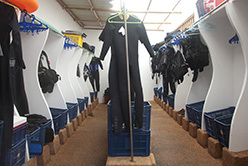 Arrangements are very flexible, as they often must be around a diving day. A selection of burgers, pastas, pizzas and salads are available throughout the day, but you can look forward to the evening meal as the gastronomic centre piece of each day. You might begin with seared scallops or beef carpaccio, followed by freshly caught prawns with sweet chilli and lemon, all rounded off with the chef’s ever changing special deserts. The wine list is exclusively French and bottles are stored in the climatically controlled cellar. For a more informal post dive wind down, head to the bar where you can choose from a selection of cocktails, international and local beers, juices and milkshakes. The Sanctuary Spa at Atmosphere is a different experience to most resort based spas. 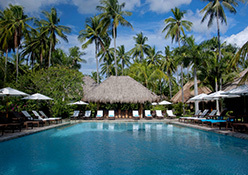 Four treatment pavilions are situated in tranquil gardens close to the heated Watsu pool used for water treatments. Massages, facials, body wraps, yoga classes and water therapy are all on offer. For families or couples with small children, Atmopshere is one of the few places where parents can enjoy some fabulous diving safe in the knowledge that their child is well looked after and having fun! In addition to baby-sitting, children can attend early education/play classes. Babies from three months old up to the age of five years can attend these fun sessions created and run by the in-house teacher. Children aged 8 and above can also take part in various SCUBA sessions. Away from the resort the island of Negros offers nature lovers some great walks in the mountain range, home to lakes, waterfalls and villages. 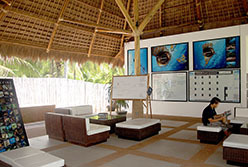 The PADI 5 Star IDC centre at Atmosphere has everything a keen diver and photographer needs to get the very best out of diving this region. The spacious briefing area, equipments room and personal storage areas are in meticulous condition. A camera room allows each photographer to work at their own space and is fitted with air guns, charging facilities and waterproof boxes. Two dive boats are perfectly equipped to whisk divers to the best local sites. The 28 metre long bangka boat named Victoria is mostly used for day trips, and Eve, the 10 metre long speed boat takes divers to local reefs. Fruit, drinks and towels are available after each dive. Local Dive Masters are great spotters and you can hire a private dive guide should you wish. Up to 5 dives a day are offered including a night dive, and divers can choose to either head out on the boats or dive on the house reef. For Apo Island boats leave at 0830 each morning for three dives, with lunch taken on the dive boat. Upon returning at around 1530, divers can dive again either from the shore or again on a boat. For dives to other local sites, which are all between 2 and 15 minutes away, boats depart at around 0800 for two dives before returning to the resort between dives or for lunch. Two additional boat dives are available in the afternoon. The operation is very flexible so the above is a guideline of a typical dive day. Dusk dives are available to see the Mandarinfish and night dives are offered daily. Divers are permitted to dive without a guide on the house reef with appropriate safety equipment, after completing one guided dive there. A full range of PADI courses is on offer. Equipment renal and nitrox are available.